Downie's third solo recording retains the indie rock-poet aesthetic of its predecessors, while splicing in a measure of arena-sized muscle borrowed from his daytime gig. On his first two solo albums, singer, songwriter, poet, and all-around Canadian Renaissance man Gord Downie broadened his artistic horizons while burnishing an indie credibility that casual observers didn't even know he had. Moonlighting from his main gig as frontman of the Tragically Hip, Downie crafted complex and ambiguous pop songs with scope and poignancy. There was not a firm delineative boundary between Downie's solo work and the Hip's output, mind you; his initial effort, 2001's bizarrely elegant Coke Machine Glow, was composed of leftfield variations on the musical tones and themes that made up 2000's Music @ Work, the Hip's most indie-friendly LP from a production standpoint. Even 2003's much weaker Battle of the Nudes, for all of its slam-poet excess, shared numerous elements with Downie’s writing for his more famous band. Once again collaborating with a hinterland who's who of his Canuck contemporaries (namely Dale Morningstar and Dave Clark of the Dinner Is Ruined, Josh Finlayson of the Skydiggers, and former Eric's Trip member and longtime solo artist Julie Doiron) and produced by Death Cab for Cutie guitarist Chris Walla, Downie's third solo recording, The Grand Bounce, retains the indie rock-poet aesthetic of its predecessors while splicing in a measure of arena-sized muscle borrowed from his daytime gig. The latter is especially palpable, and gloriously so, on the album-opening surges of "The East Wind". A favorite literary image of impending chaos and upheaval from the Greek poets down to Conan Doyle and Tolkien, Downie deepens the title phrase's inherent menace with references to the Canadian poets Todd Burley and Al Purdy (the latter's beer-soaked existentialism has long been a touchstone for Downie, who narrated and starred in Douglas Bensadoun's short film based on Purdy's "At the Quinte Hotel" in 2002). There's also an inverted invocation of Canadian painter Tom Thomson's famed The West Wind in the title, if you want to parse it (Downie is also a painter, and one of his works graces the album cover). The embedding of all of these elements into a four-and-a-half-minute rock song that soars on crescendoing strums and Downie's harmonizing with Doiron (a noteworthy complementary star on the record) is a statement to the depth and breadth of his craft. The stabbing rhythm of "The East Wind" recurs frequently throughout the rest of the album, eventually constituting a half-formed leitmotif of sorts. It drives the growling, gothic "The Dance and Its Disappearance", underscores the nautical disaster metaphors of "The Drowning Machine", and revs up the desperate nocturnal momentum of "Night Is for Getting". 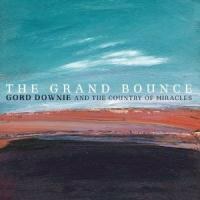 But The Grand Bounce is hardly all restless relentlessness; Downie and the Country of Miracles make the time for tweetering indie-rock shuffles like "Retrace", "Moon Over Glenora", and "Moonslow Yer Lashes" (Downie has an evident lunar predilection). Even more indelible are songs like "As a Mover" and "Gone", wherein Downie's underrated melodies climb almost imperceptively to majestic heights. That formidable melodic sense can sometimes let him down, though. "Broadcast" misplaces expressions of the haunting vastness of the Great Lakes in a meandering off-path journey with little effect (or affect), and the album's coda "Pinned" is an unintelligible piano-plinking whisper of grief. Furthermore, I'm still struggling over what exactly to make of "The Hard Canadian". The instrumental backing is uninspired and the melody is wedged between predictability and ironic recycling, but the lyric sheet reveals Downie facing up to the pitfalls of the hard-bitten rural proletarian mode of expression that he is clearly attracted to and fitfully embraces. He'll sing about the isolation, the obtuseness, and the misanthropy of such a figure with the apparent detachment of the omniscient narrator, but is he implicating himself when he wonders if "The Hard Canadian" is "just mean or willfully dense"? Where in this stark landscape does our Renaissance man stand? You never really know with Gord Downie, and you should never really expect to. That's an integral part of the pleasure.